Comprehensive professional experience makes the Crē•8 Music Academy team unrivaled in music education. Campus Director Al Machera is a music industry veteran. He began as a recording engineer in 1989 at Studio Center in Miami before moving on to Power Play Studios in New York City. Al left Power Play and joined Salt-N-Pepa in 1990. He went on to engineer and produce some of their biggest hits for the next nine years. In 2000, Al joined the Radio and Records publication to develop the company’s digital products and produce conventions. Machera partnered with Steve Burdick to create Bur-Mac Group Inc. and purchase Westlake Recording Studios in 2004. Al continued to develop artists, production companies and production music cues until 2014 when he founded the Fr8 Train Music publishing company. Machera has long been a champion of music education and opened the doors to Crē•8 Music Academy in January of 2016. Crē•8 Music Academy President Steve Burdick began his professional career at Criterion Music Publishing in 1987 as an audio engineering assistant for world renowned songwriter Diane Warren and producer Guy Roche. Later that year, he became an audio engineer and studio technician at Westlake Audio. Steve was promoted to Studio Manager at Westlake in 1988 and held the position for seven years. After stints with Canyon Digital Post Production and Vidfilm, Burdick returned to Westlake Audio as the Vice President of Recording Services in 1998. In 2004, Burdick partnered with Al Machera to create Bur-Mac Group Inc. and purchase Westlake Recording Studios. Steve is currently the President of Westlake Recording Studios and the Operations Director of Crē•8 Music Academy. Record producer, recording engineer, mix engineer and remixer Doug Fenske has collaborated with some of the music industry’s most elite artists, writers, producers and engineers. His session work includes high-profile artists such as Quincy Jones, Britney Spears, Bruno Mars, Diplo, LL Cool J, Cee Lo Green, Snoop Dogg, Andre 3000, John Legend and Herbie Hancock. He has engineered for Stargate, Eric Hudson, The Writing Camp and Ryan Tedder. Fenske has worked on a string of commercially and critically successful albums, including Frank Ocean’s Channel ORANGE, Chris Brown’s Exclusive [The FOREVER Edition], Jamie Foxx’s Intuition and Jordin Sparks’ Jordin Sparks. In 2012, he received a GRAMMY nomination for his engineering work on Channel ORANGE. Fenske has worked on over 2,000 recording sessions since 2005. 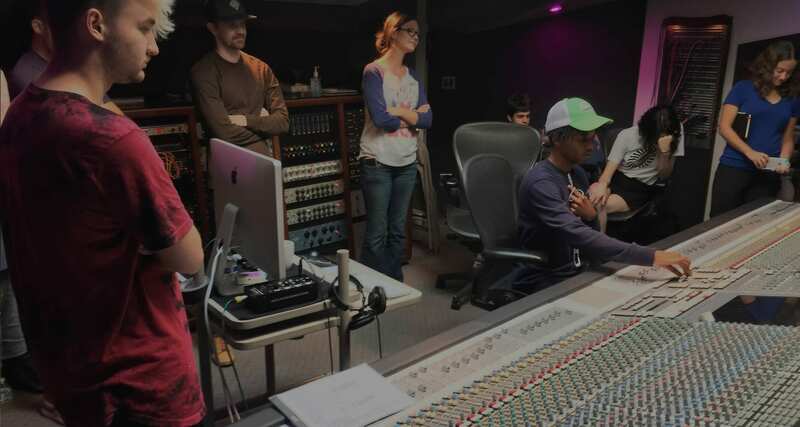 A graduate of Eastern Illinois University and The Conservatory of Recording Arts & Sciences, Fenske has been a popular instructor of production and engineering in Los Angeles since 2012. In 2014, he partnered with Westlake Recording Studios to build a comprehensive, professional record production curriculum for Crē•8 Music Academy. Fenske now serves as Director of Education and primary instructor. Admissions Coordinator Mariana Angeles was born and raised in Modesto, CA. During her formative years in Modesto, she studied piano for eight years, guitar for four years and vocal performance for three years. She went on to double major in Entrepreneurial Business in the Entertainment Industry and Philosophy at John Paul University. A customer service specialist, Angeles held the position of Concierge and Guest Service Representative in the hotel industry for five years. Previously, Mariana served as a mentor to elementary and high school students, overseeing their academic and personal health. While serving as a mentor, she developed and managed educational events for the program. Mariana says she loves being able to witness, experience and be a part of our talented creatives’ continued journey to success every day. Alex Flores has deep experience in music production with an emphasis in engineering. He has engineered professional music production sessions at Paramount Recording Studios, Ameraycan Studios and Studio Atlantis. A graduate of SAE Institute with an Audio Technology diploma, Alex was the Studio Manager and Head Lab Instructor of an audio engineering school for five years. Flores supervised the operation and maintenance of a multi-studio facility, taught classes, managed a group of lab instructors, updated curriculum and administered campus policies. During this time, he was instrumental in developing a Campus Effectiveness Plan for a recording school with campuses in more than 26 countries. Flores continues to mentor alumni of his previous institutions, guiding their professional careers and aspirations. Alex oversees all on-campus operations at Crē•8 Music Academy, including student-producer studio sessions and facility procedures. Joelina Robinson Machera is currently attending Pepperdine University while working towards a doctorate in education. She also serves as an Advocacy Advisor for Crē•8 Music Academy. Previously, Joelina was the Director of Equity and Inclusion at The Buckley School in Sherman Oaks, CA and traveled with the National Institute of Independent Schools and Western Association of Schools and Colleges as an inclusion specialist, trainer and accreditation leader. Joelina attended St. Mary’s University in San Antonio, TX where she received her degree in English Communications and Political Science. After stops in Atlanta and New York City, she moved to Los Angeles to work with the Anti-Defamation League’s A World of Difference where she developed programs to train educators and students in diversity and multiculturalism. While working in Los Angeles, Joelina was named Teacher of the Year in Glendale Unified and Los Angeles County for her work at Hoover High School. Student body diversity and inclusion are her area of focus at Crē•8 Music Academy. Virginia Fenske-Mathers is an adjunct professor for The Division of Psychology and Counseling at Governors State University and the Compliance & Student Affairs Advisor at Crē•8 Music Academy. Previously, Virginia was the Alternative Education Counselor for Rich Township High School District #227. During this time, Fenske-Mathers was a counselor and advocate for 100+ credit-deficient high school students and supported them through the delivery of a comprehensive school counseling program based on the ASCA model. She has also served as a teacher and guidance counselor at the high school and junior high levels. In 1975, Virginia graduated from Kent State University with a BS in Elementary Education and an MEd in School Counseling. Having been involved in education at every level during a career that has spanned over 40 years, she has guided and impacted thousands of student lives. Fenske-Mathers advises Crē•8 Music Academy with regard to higher education compliance and student affairs, sharing her knowledge from a life dedicated to education and the development of aspiring minds. 2016 and 2017 finalist in the International Songwriting Competition (out of 160k applicants) in the Adult Contemporary Category. Spotlight placements on MTV, WB Online and Apple.